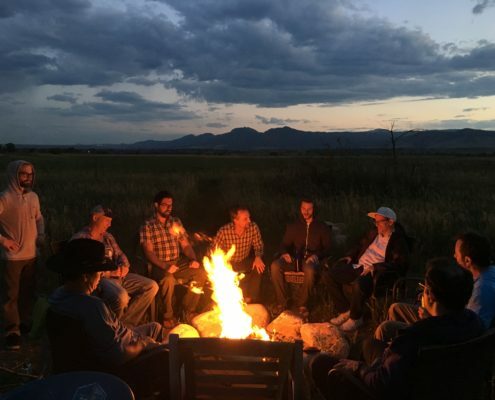 Eagle Prairie Men’s Tribe is a community of high-caliber men up-leveling and transforming their lives—dissolving relationship struggles, embodying who they truly are and what they value most, and living it as fully as they can, to create their most inspired life of purpose. Joining tribe is about identifying and dismantling self-limiting patterns, restoring your experience of wholeness and belonging, and recognizing and delivering your deepest gifts as a contribution to this world. 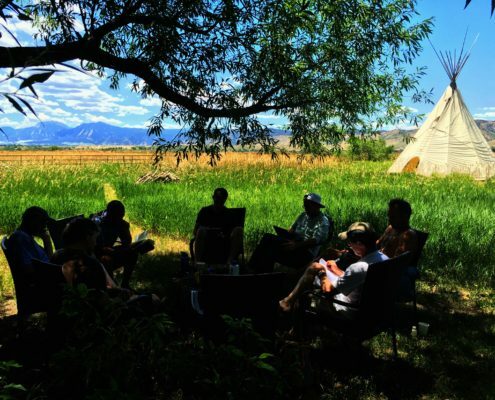 Eagle Prairie Men’s Tribe utilizes an in-person, land-based, facilitated small group format to individually and collectively integrate profound evolutionary tools into our lives. Tribe meets once each week for a year, with four additional weekend intensives spread across the seasons. Through these sessions, additional weekly accountability connection with group members outside of group time, and one-on-one coaching with Reuvain, men align their lives with their highest values and vision. They uncover and dismantle old patterns that block their authentic self, their relationships and their purpose work in the world. Reuvain’s proven methodology and Tribe’s extended duration deliver and sustain results well beyond counseling. Providing an opportunity for ever-deepening connections with the same men and a venue for receiving and delivering priceless, laser feedback, Tribe serves as a laboratory for trying on new, more awake, self-aligned ways of being that are increasingly free from old, limiting patterns. Participants align with and live their life’s most inspiring purpose, clear relationship issues and feel energized and whole in a way they never have. Build the framework for dynamic forward-motion in your life. Real, lasting change takes time and disciplined, supported effort. Eagle Prairie Men’s Tribe is set up as a full year evolutionary mission. We’ll be the support, challenge and accountability needed for each man to identify, ignite, integrate and sustain profound changes. To live them. That’s the point. I have found no better path to personal growth and empowerment than through Reuvain’s Year-Long Men’s Tribe and 8-week men’s groups. I cannot overstate the skill and expertise Reuvain brings to facilitating these groups. For me, Tribe is about CONNECTION. By meeting and connecting with a group of high-quality men, I am constantly challenged to be my best self. Only through feeling connected can we start to escape our limiting patterns and behaviors. And I’ve formed deep friendships in a way I wanted to for years but was never able to accomplish on my own. Reuvain creates an environment where I’ve felt that anything is possible. His instincts are highly adept. With his guidance, change feels not only doable, but palpable. The 8-week group broke me open and awaked me to fundamental life priorities. It was so potent that I was hungry for more, so I joined his year-long men’s Tribe. The work we do there, with each other, is simply compelling. On an everyday basis, I use those techniques to help stay on my life’s purpose in the most powerful ways: in service to my community, my family and my mission. My wife has noticed the difference. Reuvain brings a unique, calming style and an amazing blend of teachings. He and the Eagle Prairie Men’s Tribe have helped free me from the trap of my triggers and old habits that have kept me stuck for years. The tribe’s continuity provides a rare opportunity of safety, support, and time to really get work done.